Remember The Last Starfighter, where aliens recruit some schmoe to fight in their space war because of his video game skills? Well, the Navy is sort of stealing that concept, except with boats instead of spaceships. On May 16, the Office of Naval Research is planning to launch the first pilot of its Massively Multiplayer Online War Game Levering the Internet (MMOWGLI). Together with Silicon Valley’s Institute for the Future and the Naval Postgraduate School, the ONR plans to run the internet wargame for three weeks and will be starting off with a scenario about combating Somalian piracy. Similar to Jane McGonigal’s 2007 World Without Oil, or Urgent Evoke!, the Navy’s new game will present real-world problems and prompt players to find solutions for the problems. However, the Navy intends to use some of the data garnered from player suggestions for real-world solutions. This interactive crowdsourcing project plans to recruit players from academia, defense, government and nongovernment organizations in order to tap into the “intellectual capital of a broader community”. The ONR hopes that this diversity of ideas from over 1,000 players will either be an arena where ideas will fuse and build off of each other, creating “game-changing solutions”, or teach researchers something about the traditional thought process. 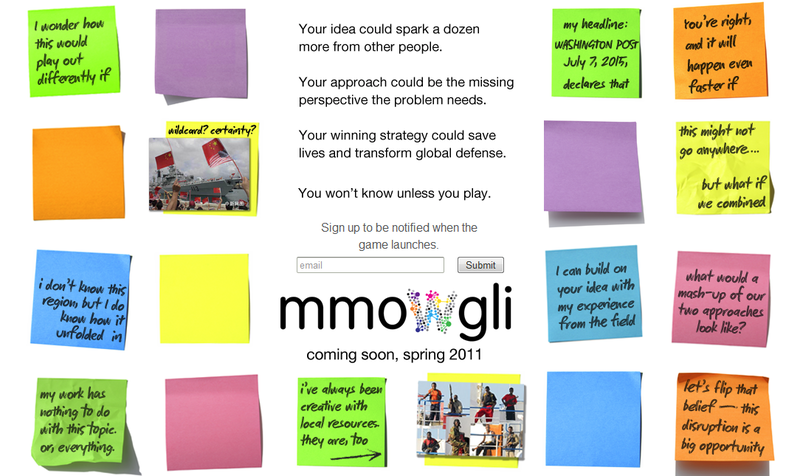 “MMOWGLI is an online game designed to find and collectively grow breakthrough ideas to some of the Navy’s most complex problems–those 21st-century threats that demand new forms of collaboration and truly outlying ideas,” said Dr. Larry Schuette, the director of Innovation at ONR. An article on manoshevitz.com said that the game will be broken into three parts. The first will be an initial planning stage and the next two parts will include carrying out an actual mission against “virtual pirates”.